This pattern is about integrating web sites and applications by using standard feed formats to convey timely information, updates, status messages, events and other things from one web application to another. Take advantage of the many tools and services that can produce, consume, aggregate and build work-flows around feeds as a way to integrate web applications. Use a standards-based approach to ensure that that widest range of feed producers and consumers can be supported. Make it so everybody who needs can read your feeds. Pretty amazing to see a government so tech-savvy. Uncle Sam should contact Manning, who, I'm pretty sure, has stacks of RSS and Atom In Action available for a very good price. Updating RSS and Atom in Action? Check out Tim Bray's Atomic Monday post for a summary of recent developments in the world of AtomPub protocol and Atom format. With the uptick in interest in Atom and especially AtomPub protocol's usage in mainstream APIs from Google and Microsoft, I wonder if if would make sense to update RSS and Atom in Action. The bulk of the book is up-to-date, for what it covers. RSS and Atom haven't really changed and, though the book came out before the spec was finalized, the AtomPub material is basically sound. The ROME material is still current too. What's missing are all of the new developments: a dozen or more new AtomPub based APIs from Google (GData and OpenSocial) and Microsoft (Live and Astoria) and new tools like Apache Abdera (incubating). Not to mention Windows RSS Platform 2.0 and ROME 1.0 (which is coming soon). Updating the book to cover all of those topics would be quite an endeavor and I'm not sure it's the right approach to covering AtomPub. What do you think? For Java developers starting out with RSS and Atom, here are some notes to help you figure out the differences between the Java.net ROME and Apache Abdera (incubating) projects. 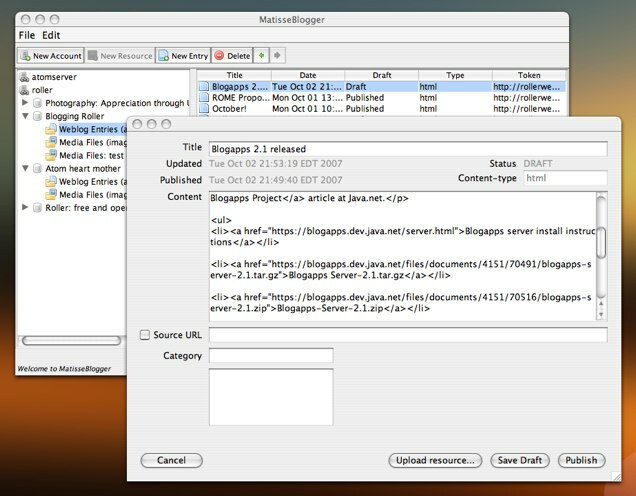 ROME is a set of Java tools for parsing, fetching and generating all forms of RSS and Atom feeds. The core ROME library is relatively small and depends only on the somewhat creaky old JDOM XML parser. Available separately are modules to support various feed extensions such as OpenSearch, iTunes, GeoRSS, etc. ROME was originally developed and open sourced by Sun Portal dev team members in 2004. ROME Propono is a subproject of ROME that supports publishing/editing entries and files to blog servers and AtomPub servers. Propono is made up of three parts: 1) a Blog Client library can publish via either the old lagacy MetaWeblog API or the shiny new AtomPub protocol, 2) an AtomPub client that publishes only via AtomPub and 3) a framework for creating AtomPub servers. Propono was developed by Ramesh Mandava and Dave Johnson, based on code from RSS and Atom in Action and open sourced as part of the Sun Web Developer Pack in 2007. Abdera is a set of Java tools for working with Atom feeds and AtomPub protocol. This includes a parser, writers, an AtomPub client and a framework for creating AtomPub servers. Abdera's Atom feed parser uses STAX, so it uses less memory and is faster than ROME. Abdera's Atom feed support is more comprehensive than ROME's and it supports signatures, encryption, Atom to JSON, extensions for Threading, Paging, GeoRSS, OpenSearch, GoogleLogin, etc. etc. Abdera was developed by IBM and contribued to Apache in 2006. Con: no RSS support (there is something in Abdera contrib, but it's incomplete). There you have it. ROME and Abdera folks: think that's a fair comparison? Are you a ROME or Abdera user? How would you like to see these frameworks move forward? Another thing I worked on over the winter break was an all-Dave feed, a single page and feed that combines all of the various things that I post to the web: blog entries, Flickr photos, del.icio.us links and Twitter activity. So far, this is what I've got: http://rollerweblogger.org/roller/page/feeds. RSS and Atom in Action has been out for over a year now and just as the phenomenal sales are starting to drop off, something wonderful has happened. The book has been nominated for the prestigious Stephen T. Colbert Award for Literary Excellence. As you can see in the photo above, at least one copy of the book is already carrying the Colbert nominee seal. 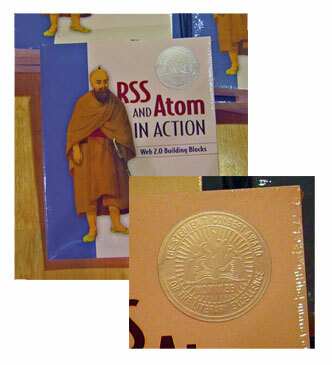 Avoid the rush and buy your copy of RSS and Atom in Action now. Those who have read Colbert's I Am America (And So Can You!) will understand the significance of this important award and understand the impact on future sales of the book. To learn more about the nomination process and criteria, buy yourself a copy of Colbert's book and then flip to page 214½. Cheers! "The complete roster is Tony, Greg Luck (Wotif.com) and Pierre Delisle (Google), and Simon and myself (Sun)"
Bistro! : GlassFish/SJS AS in production - which bundle, which profile, ...? "Red Hat has signed Sun's broad contributor agreement that covers participation in all Sun-led open source projects." Shows "basic demonstration-level OpenSocial container can be implemented"
"Despite these misgivings, I think this is a step in the right direction. Web widget and social graph APIs need to be standardized across the Web." "lots and lots of things that can be modeled as collections of web resources"
"While APP is not the one true protocol, I think I?m hooked"
Joe Cheng: Iâm starting a (hopefully short) series of blog posts documenting the specifics of how the upcoming AtomPub-enabled release of Windows Live Writer will behave, and what AtomPub-enabled blog* servers can do to ensure the best interop with us. I also hope other blog client implementers can learn from our experience and consider using the same rules and behaviors we do when implementing their own AtomPub support. Very nice. I'll be watching this one closely, looking for ways to improve Roller's and ROME's AtomPub support. Sujit Pal: "However, Dave Johnson's book provides a lot of background information and a lot of nice examples in Java and C#. I would highly recommend it to anyone who needs to get up to speed quickly with ROME and RSS/Atom." It's good to see people are still buying and finding the book useful. It's been out for over a year now, but I don't think it's really out of date at all. I've been keeping the examples up-to-date as part of the Blogapps project and even enhancing them: the example Atom protocol client code from the book is now part of the ROME Propono project. The first release to discuss is ROME Propono, which includes a ROME based Atom protocol client library, Atom protocol server framework and an Blog Client library abstraction that supports both Atom protocol and the MetaWeblog API. I've been working on Propono 0.6 off-and-on since May, keeping it in sync with the latest version of the Atom protocol, testing it against Tim Bray's APE and adding various improvements needed in my other projects. Over the weekend I finally had enough time to get a release out. You can find the full-details at the link below but basically this release adds support for the final Atom Publishing Protocol specification and better support for relative URIs. What's next? Once ROME 1.0 is released Real Soon Now, I'll get a another release out and I'll probably call it ROME Propono 1.0. Just learned from Tim's blog that Greg Borenstein just came up with a cute logo for the Atom Protocol Exerciser (Ape), which, in case you don't know, is the closest thing we have to a compatibility test for Atom servers. The logo is featured on the Ape's home page. There's some very cool Atom news from Tim Bray this week. First, there's mod_atom , a plugin for the Apache HTTPD web server that provides a stripped down Atom server (written in C) that stores Atom entries as files. So now any HTTPD server can serve as a simple Atom store. Second, Tim mentioned that he's updated his Atom Protocol Exerciser (Ape) to support the new Atom protocol namespace and to add a couple of new tests. That's perfect timing for me because I'm starting to work on Roller's APP implementation and some other APP based things. I need my own local copy of the Ape, so I decided to download the code an get it up and running. To make things easy, I decided to do this work on my Ubuntu system because it's already setup with gcc, cvs, Apache HTTPD and Ruby. For my future reference and to help other Atom fans to get started, here are my notes from my Ape setup experience.